Air-O-Swiss have been known for their advanced ultrasonic humidifiers as well as many other air purification solutions. What puts them ahead of their competition is their ability to integrate high-end technology to create the best atmosphere for you. Their ultrasonic humidifiers use high-frequency vibrations to generate micro-fine mist, with some models digitally controlled. In today’s post, we’ll be comparing the most popular Air-O-Swiss ultrasonic humidifiers: AOS U700 vs. AOS 7147 vs.AOS 7135. Digital Warm and Cool Mist Ultrasonic humidifiers. High humidity output, suitable for large rooms up to 1000 sq ft.
ITC Technology (Intelligent Temperature Compensation) monitors the temperature and automatically adjusts output accordingly. Automatic shut-off when water tank is removed. Light sensor activates dimming LED lights for relaxing ambient night light. Water change reminder. Cleaning and maintaining alerts. Click here to learn more about the AOS U700 Digital Humidifier, read the customer reviews and buy it. Humidity output suitable for rooms up to 600 sq ft.
ITC technology (Intelligent Temperature Compensation) for automatic adjustment according to temperature. Sleep Mode is pre- determined by the humidifier for the best humidity level for night. Timer can be set for 1 to 8 hours or for continuous operation. Click here to learn more about the AOS 7147 Humidifier, read the customer reviews and buy it. Humidity output for up to 650 sq ft.
Timer 1 to 9 hours. Click here to learn more about the AOS 7135 Humidifier, read the customer reviews and buy it. Large water tank/high humidity output-Suitable for rooms up to 1000 sq. ft.
Do not place unit on the floor! Elevate to enable mist to diffuse adequately. How Is The AOS U700 Different Than the AOS 7147 and AOS 7135? Its largest humidity output level for rooms up to 1000 sq. ft.
Its largest water tank at 2.5 gallons. Built-in light sensor activates LED night light automatically, only when needed. The ability to add fragrance to your warm or cool mist. Self cleaning mode as well as alerts for water change and maintenance. What Is The Difference Between the AOS 7147 and AOS 7135? The AOS 7135 has a larger output suitable for rooms up to 650 sq. ft. vs. 600 sq. ft. for the AOS 7147. The water tank capacity for the AOS 7135 is larger, 1.75 gallons. As for the AOS 7147, the capacity is 1.5 gallons. The timer on the AOS 7135 can be set from 1 to 9 hours, where on the AOS 7147 it’s 1 to 8 hours. Which Is The Best One To Buy? When it comes to performance, all of these Air-O-Swiss are top performers. 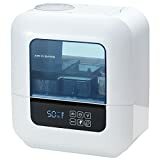 Which one to buy relies solely on your personal use, you’ll need to think about how large the area you want to cover and how long you’ll be keeping the humidifier on, especially at night. If you want a humidifier suited for a large area, then the U700 is the obvious choice as it covers up to 1000 sq. ft. The U700 is an excellent choice too for someone who wants a humidifier that requires less maintenance and cleaning, as it takes care of itself. The LED night light is also a great add-on feature. Other than that, the AOS 7135 offers a timer for 1 to 9 hours, which is longer than the AOS 7147, and a larger water tank.